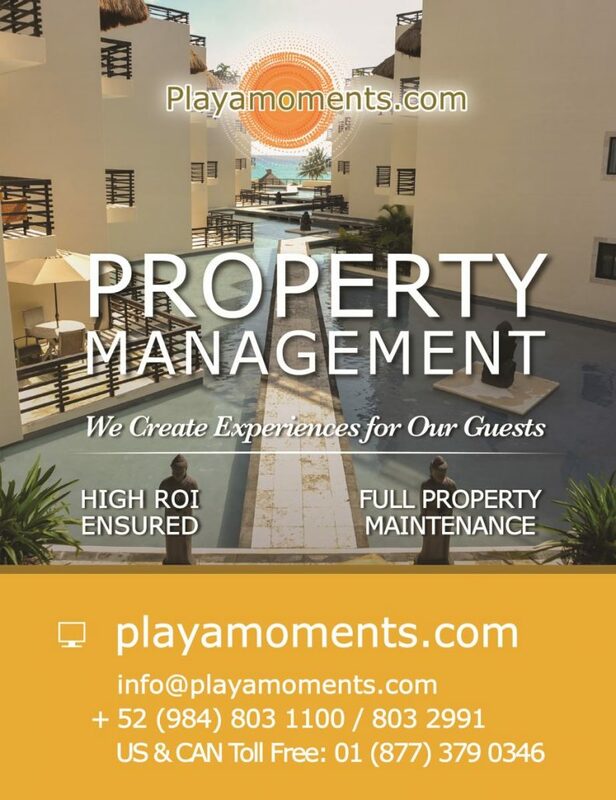 PLAYA MOMENTS is based in Playa del Carmen and specializes in turn key solution for a full Property Management. We specialize in vacation rentals. We have the expertise & talent to provide the most personalized advise for every inquire you may have. The Management System employed by PLAYA MOMENTS is set up to accommodate the absentee owner, assuring that your investment is cared for with the utmost care and respect. Included in all management services are regularly scheduled cleaning and maintenance programs as well as payment of all primary utility bills, Home Owners Association dues, assembly representation and tax payments among many other services. All owners have secure, 24/7 access to their online account and owner statements. Guest Services: From reservation inquiries to secure, online booking; from check-in to repair calls; from concierge services to housekeeping and inspections; property managers take care of guests and vacation properties 24 hours a day.supplied by PLAYA MOMENTS at our expense. Globally marketing your unit: This page will serve as the primary marketing portal for the property. Potential renters will also be able to view the reservation calendar and to make reservations online. The ultimate goal is to paint each property in its best light and to make the reservation process as easy as possible.We know Internet marketing! We know Search Engine Optimization! Our websites are attractive, easy to use and up-to-date. We know how to help guests find your property online –easily – when they are planning a vacation in the area. We manage email marketing to past guests, social media marketing, listing sites and a variety of other internet marketing strategies that will lead browsers to our website and to book our properties. Inspections and cleaning before and after each rental: We employ trained, skilled housekeepers who keep your vacation rental home cleaned to industry standards. Inspectors are in your property before and after every guest, ensuring consistency, quality and making sure that everything is in order. Customer follow-up service: After check out we contact our customers in order to develop a good relationship which is used as a way to keep customers happy. We make a follow-up call to our customers so we can get a Feedback to ensure that each unit meets and hopefully exceeds expectation. Information obtained is kept on file and used for future reference. Data collected also helps with ongoing marketing. This information will be made available to the owners via electronic mail at their request. Additional Services: Additional housekeeping services, golf cart rentals, linen services and much more…professional managers offer guests everything they need for a great vacation.customers to ask them how they like the service or if they have any questions. This is a great way to keep our customers happy and get product feedback.